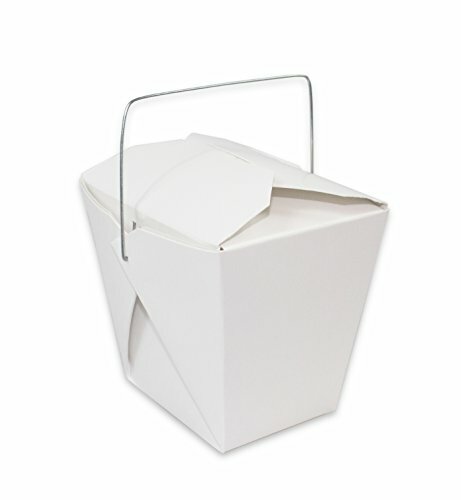 Chinese take out boxes are perfect for party and wedding favors, creative food packaging, candy, cookies and more. White in Color,easy to use. Make your home meal prep or restaurant's take out service as remarkable as your dine-in service with this attractive 16 oz. Fit Meal Prep take out container. 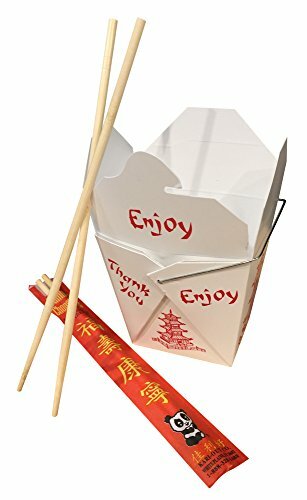 This white, versatile container is popularly used in Chinese / Asian restaurants, but it can be used for just about any products. Its leak and grease resistant packaging keeps hot, cold, wet, or dry foods fresh. The convenient one piece design of the package maintains freshness by retaining heat and venting steam. Make carrying easy with this container's wire handle. Cost effective and functional, the take out container is also moderate heat lamp tolerant and recyclable. Environmentally-conscious consumers will love the packaging made from sustainable resources. Bottom: 3" x 2 1/2"
50 pack, dimensions: top: 4 x 3", bottom: 3 x 2.5, height: 3.25 inches, metal handle for easy carrying, made out of environmentally-friendly white paper, ecologically sustainable container. Capacity: 16 oz. Size big enough to house full meals, sides or appetizers, great for packaging carry out hot or cold food. Leak- and grease-resistant, tab lock top maintains freshness and heat, conveniently nests with multiple containers for compact storage. Disposable for easy clean up, ideal addition to a busy household, fast food deli, or Asian restaurant. 100% satisfaction guarantee - contact us if not satisfied with our product and we will send you a new replacement or issue you a full refund. Make your home meal prep or restaurant's take out service as remarkable as your dine-in service with this attractive 26 oz. Fit Meal Prep take out container. 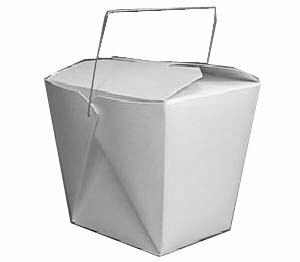 This white, versatile container is popularly used in Chinese / Asian restaurants, but it can be used for just about any products. Its leak and grease resistant packaging keeps hot, cold, wet, or dry foods fresh. The convenient one piece design of the package maintains freshness by retaining heat and venting steam. Make carrying easy with this container's wire handle. Cost effective and functional, the take out container is also moderate heat lamp tolerant and recyclable. Environmentally-conscious consumers will love the packaging made from sustainable resources. Top: 4 1/4" x 3 5/8"
Bottom: 3 1/8" x 2 5/8"
50 pack, dimensions: top: 4.25"x3.6", bottom: 3.12"x2.6", height: 4", metal handle for easy carrying, made out of environmentally-friendly white paper, ecologically sustainable container. Capacity: 26 oz. Size big enough to house large full meals, sides or appetizers, great for packaging carry out hot or cold food. This versatile container can be used for just any food: rice and noodles, meals, snacks, leftovers, as well as candy, cookies, cupcakes and more. 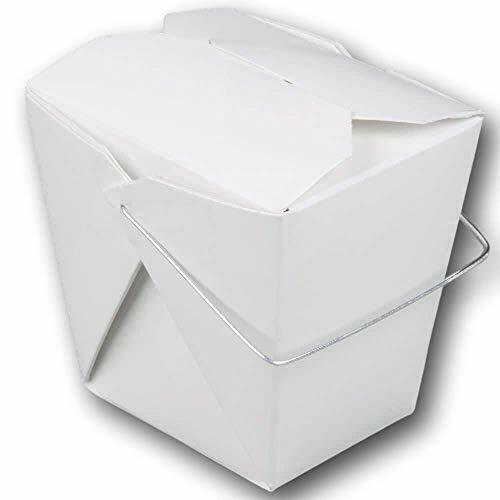 While in use, the asian style delivery box is durable and grease-resistant. 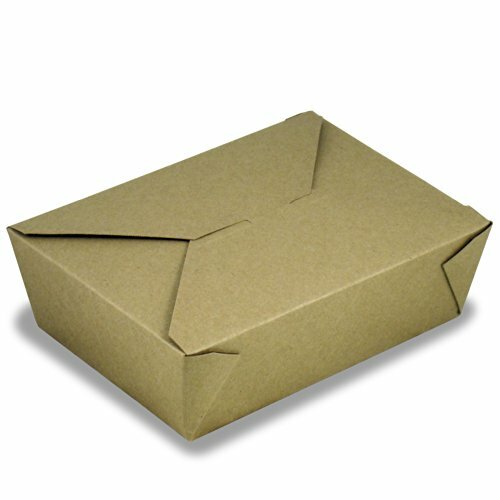 Chinese takeout container is easy to fold and close. The natural paper texture ensures that it can be labeled, so you won't get confused if you use more than one. The boxes are stackable and made from 100% recyclable material. Take the advantages of disposable food containers without harming nature! Dimensions: Top: 3 3/4" x 2 7/8" Bottom: 3" x 2 1/8" Height: 3 1/4"
SATISFACTION GUARANTEED: If you are not satisfied with that food containers, return it within 20 business days for a FULL REFUND. No questions asked! Green Direct has designed beautiful "Party favor boxes". It is The ideal Party Favor Box to set at your Upcoming Gatherings and Celebrations. You can decorate the outside according to your Color Theme, or you can just leave it as is and have it as a welcome greet at everyone's place ready to enjoy. It is also very cute to fill with the party nosh and have the children take it along to their after party entertainment. Just stock up on these Fantastic chinese food containers and have them ready for the upcoming Party, Event, or Gathering. Just click "Add to Cart" Now and Enjoy it! 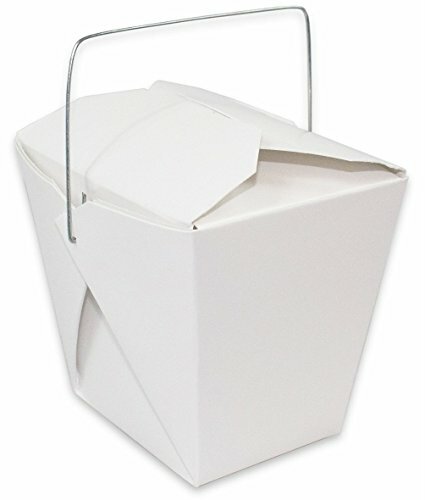 These "Great" Chinese take out boxes are Super to use at any time. It is Excellent to be used for home enjoyments and as party favor boxes. It is 16 oz. and is perfect to Fill with your favorite candies or other small goodies. The durable makeup of the box enhances it beautiful look and your guest will be astonished by your event when they will receive these adorable white favor boxes with the attached medal handle, for them to enjoy or take home as a souvenir from your gathering!!! Green Direct has a designed a Super new innovation. These food gift boxes are designed with you in mind. The party boxes come with an attached metal wire which adds a cute touch and a neat appearance for the box. The wire handle makes it also easy to transport to any outdoor gathering or event, and also convenient for your guest to take it home as a souvenir! These baby shower favors boxes are the ideal party gift boxes for your upcoming baby shower. Fill it with any type of chocolate or nuts and set at every guest setting. it is also suitable to set at any other party as Wedding Favors, Birthday Gable Boxes, Candy Buffet Supplies, Favor Boxes, Guest Gifts. Create a Fun Dessert Table and Pair with Favor Bags, Popcorn Boxes, Vintage Straws & More from Food with Fashion! These boxes are also Great for any other use, like filling it fruits or vegetable to engage your children to eat healthy, happy and with a smile. It is perfect to add to your child's lunch such chinese food boxes filled with healthy snacks. It will hold neatly upright and won't leak any liquids. This Super Package from Green Direct comes with 50 16 oz. Stunning pre-assembled Chinese food boxes which is designed to dress up your party place setting or Viennese table, it is great for deli salads, pasta dishes and cookies, So make sure to stock up now for your upcoming event, gatherings, and occasions. Its upscale, pagoda pattern is popularly used in Chinese/Asian restaurants, but this versatile container can be used for just about any products. Its leak and grease resistant packaging keeps hot, cold, wet, or dry foods fresh. The convenient one piece design of the package maintains freshness by retaining heat and venting steam. Make carrying easy with this container's wire handle. Environmentally-conscious consumers will love the packaging made from sustainable resources. 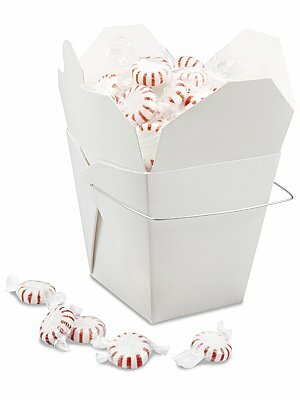 Chinese take out boxes are perfect for party and wedding favors, creative food packaging, candy, cookies and more. 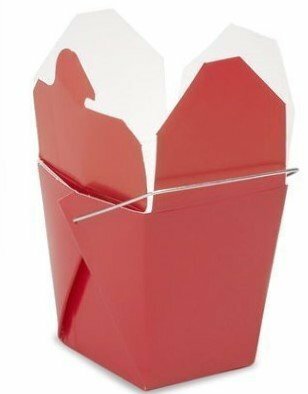 These Chinese take-out boxes are perfect for all of your food container needs. Great for use as wedding favors, part favors, candy, crafts, and much more! Each purchase includes 40 containers. 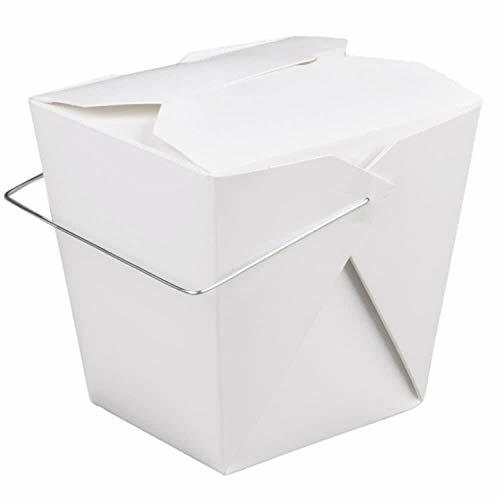 Its upscale, pagoda pattern is popularly used in Chinese/Asian restaurants, but this versatile container can be used for just about any product. Its leak and grease resistant packaging keeps hot, cold, wet, or dry foods fresh. The convenient one piece design of the package maintains freshness by retaining heat and venting steam. Its convenient wire handle makes carrying easy. Environmentally-conscious consumers will love the packaging made from sustainable resources. 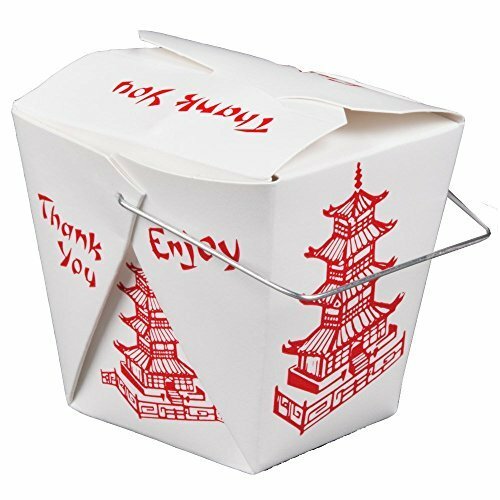 Chinese take out boxes are perfect for party and wedding favors, creative food packaging, candy, cookies and more. *Due to the wire carry handle - these containers are not microwave safe. The 9" bamboo chopsticks are a fun alternative to traditional flatware. Also ideal for cooking use, each non-connected pair of chopsticks is packaged individually in a colorful sleeve. The lettering says "good luck, long life, good health, and well-being." You will receive 25 containers with carry handle and 25 Chopsticks carefully put together in DHI packaging! Its upscale, pagoda pattern is popularly used in Chinese/Asian restaurants, but this versatile container can be used for just about any product. Its leak and grease resistant packaging keeps hot, cold, wet, or dry foods fresh. The convenient one piece design of the package maintains freshness by retaining heat and venting steam. Its convenient wire handle makes carrying easy. Environmentally-conscious consumers will love the packaging made from sustainable resources. 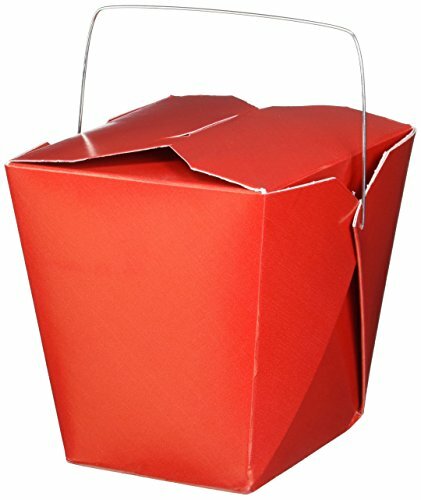 Chinese take out boxes are perfect for party and wedding favors, creative food packaging, candy, cookies and more. *Due to the wire carry handle - these containers are not microwave safe. The 9" bamboo chopsticks are a fun alternative to traditional flatware. 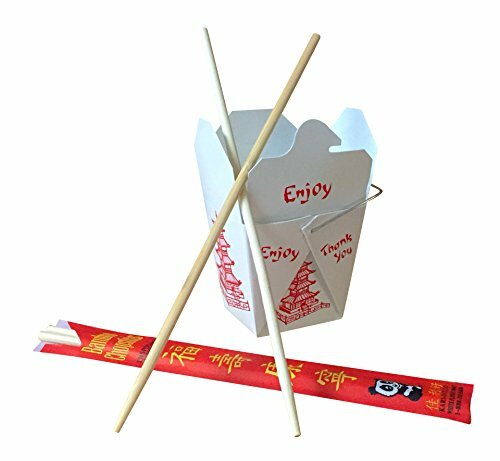 Also ideal for cooking use, each non-connected pair of chopsticks is packaged individually in a colorful sleeve. The lettering says "good luck, long life, good health, and well-being." You will receive 25 8oz containers with carry handle and 25 Chopsticks carefully put together in DHI packaging! 20 1 Quart boxes. Creative packaging for food and party favors. Convenient wire carrying handle. 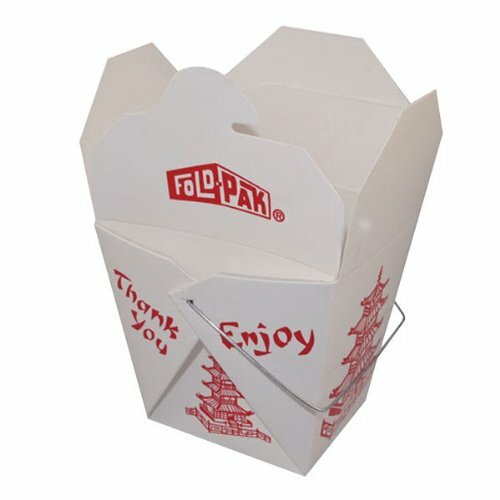 Chinese take out boxes are perfect for party and wedding favors, creative food packaging, candy, cookies and more. RED in Color, Also available in White and Black. Only top-quality SBS paperboard is used, with a poly coating on the inside to ensure leak resistance and to keep your product fresh and ready to eat. 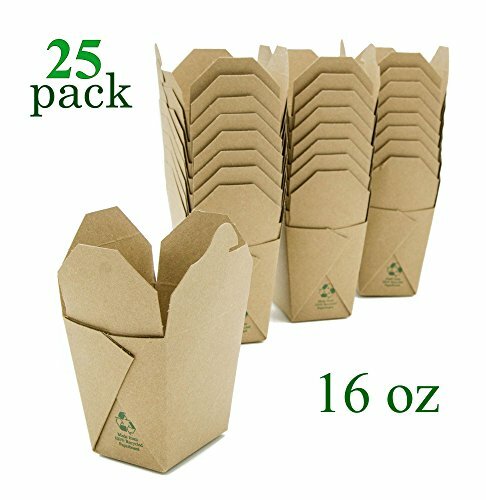 The box from eco source is the most versatile and easiest to use of available carry-out containers that comes in five different sizes. Made from 20% post-consumer recycled paper. The natural kraft paperboard is lined with a poly coating to give superior leak and grease resistance. Microwave safe and is recyclable where proper facilities exist. Available in white paperboard. 8 ounces, 1/2 pint capacity. 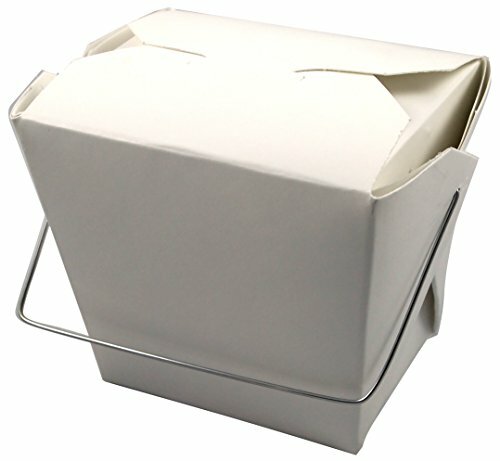 Fold-Pak is America's favorite carry-out food pail. As the largest, most experienced manufacturer of pails for the food service industry, our name is synonymous with high quality and reliability. We use only top-quality SBS paperboard, with a poly coating on the inside to ensure leak resistance and to keep your product fresh and ready to eat.